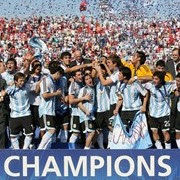 Argentina came from a goal down to defeat the Czech Republic 2-1 in the final of the U-20 World Cup last night. Argentina dominated possession in the first half, but were unable to break down the defensive Czechs, who rarely threatened apart from a couple of counter attacks. The half was full of niggling free kicks, with the Czechs seemingly unwilling to allow any Argentines to turn without bringing them down. After the poor first half, the game sprung to life in the second. Within six minutes, Maxi Moralez was played in by Sergio Aguero, but could only fire his shot straight at the Czech keeper. The Czechs then had a menacing attack of their own, Sergio Romero having to be at full stretch to pull off a magnificent save from Lubos Kalouda's header. A net finally bulged in the 60th minute as Czech striker Martin Fenin turned and fired an unstoppable half volley past Romero to give his side the lead. Their lead didn't last long, Ever Banega splitting the Czech defense with a pin-point through ball to Aguero who calmly slotted the ball home for the equaliser. Argentina came to life after the equaliser, with both Banega and Aguero frequently getting on the ball and causing problems for the Czech defense. Despite their efforts, the game looked like it was destined for extra time until 4 minutes from time when Mauro Zarate turned and fired a shot past the Czech keeper from 20 yards. Despite a late charge from the Czechs, Argentina held on for the victory, their fourth truimph in the last six times this tournament has been played. After playing some great football throughout the tournament it was justice to see Argentina come out victorious, despite the Czech Republic's best efforts to turn the game into a boring affair by piling men behind the ball. Sergio Aguero picked up both the Golden Boot award for top scorer with six goals, but also the Golden Shoe award, given to the best overall player in the finals. Earlier on in the day, Chile defeated Austria 1-0 to secure a third place finish. A spectacular Hans Martinez strike on the stroke of half time was enough to give them the victory.